Dutch artist Folkert de Jong returns to the HVCCA with a massive site-specific installation entitled Mount Maslow. De Jong is one of the most innovative young sculptors today whose first museum exposure in the US was at the HVCCA in two seminal exhibitions: "Figure It Out" and "Reverence." 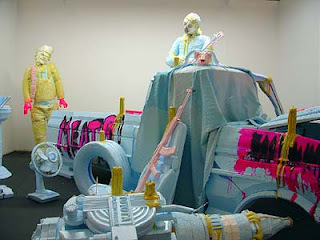 In his work, De Jong stages chaotic figurative scenes using Styrofoam and polyurethane foam. His works are often concerned with historical issues as well as current issues of the moment such as wars and the abuse of power. His works convey an uncanny and dream-like quality where the perverse often collides with the familiar. The concept behind "Mount Maslow" originated in De Jong's interest in the work of Abraham Maslow, psychologist/philosopher, who proposed 'a pyramid of needs' in his 1943 paper 'A Theory of Human Motivation'. Maslow's theory contended that as humans meet 'basic needs', they seek to satisfy successively 'higher needs' that occupy a set hierarchy. For De Jong, it seems inevitable that humans will always seek more through whatever means necessary, yet the peak of the 'pyramid of needs' is something elusive and intangible: spiritual fulfillment. 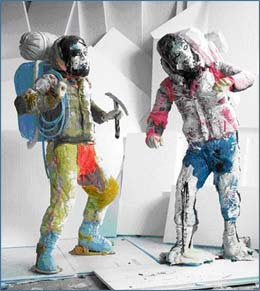 In "Mount Maslow" a Styrofoam snow mountain structure reaches up 18 feet on which are two bearded figures in mountain climbing gear. They appear to have halted to stare at a prophecy. Carved in the endless ice of the glacier in giant letters are the words 'Hamburger Hill'. Set in May 1969 during the Vietnam War, 'Hamburger Hill' is a movie based on an account of the strategic assault by the U.S. Army on a well-fortified position of the North Vietnamese Army. 'Hamburger Hill' is a favorite of some on the political right, with its bombastic macho posturing. Here the struggle is seen as noble. 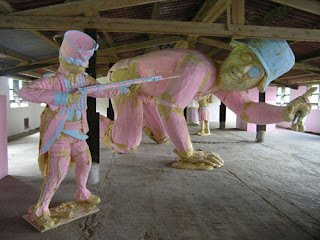 De Jong once again acknowledges that the retelling of history requires many voices; all renditions of war are relevant. 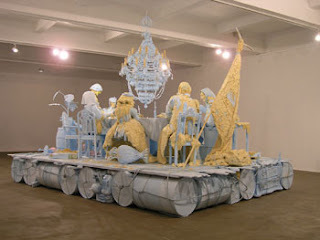 Layering references to spiritual aspiration, war, popular culture, and philosophical propositions, De Jong performs a signature remixing of complex contemporary social and political issues. "Mount Maslow" functions ambiguously as both a monument to the human quest for progress and a stark memorial to the waste that results when egotism is confused for transcendentalism.